The official magazine of the United Brotherhood of Carpenters. 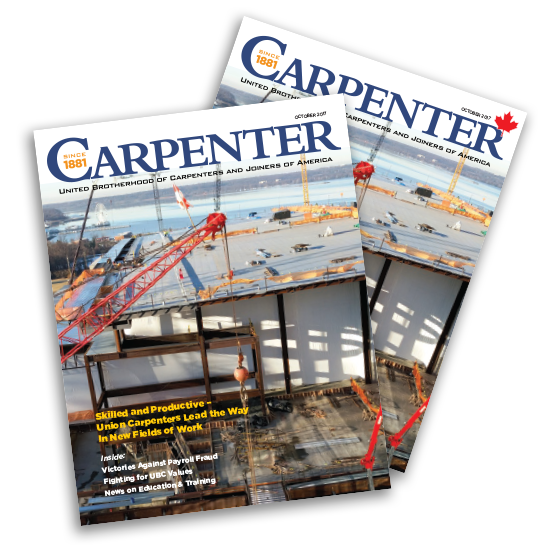 The Carpenter, now known as Carpenter Magazine, began in 1881 as a monthly publication produced by the UBC to inform all dues-paying members of newsworthy events within the union. The first issue was so well-received and in such high demand that local unions and members had to request additional copies. While the frequency of the publication has slowly decreased over the years, UBC’s website continues to grow and has become an additional go-to source for member stories, news, and union information. UBC continues to publish the Magazine once a year, making it one of the oldest continuously published magazines in North America. Archived issues of the Magazine are available online thanks to the Lyrasis Mass Digitization Collaborative at the University of Maryland. This project is part of an endeavor to fully process, digitize, and make accessible the United Brotherhood of Carpenters and Joiners of America archives. Currently, only the issues from 1881-1989 are available online. CLICK HERE to view the archives.